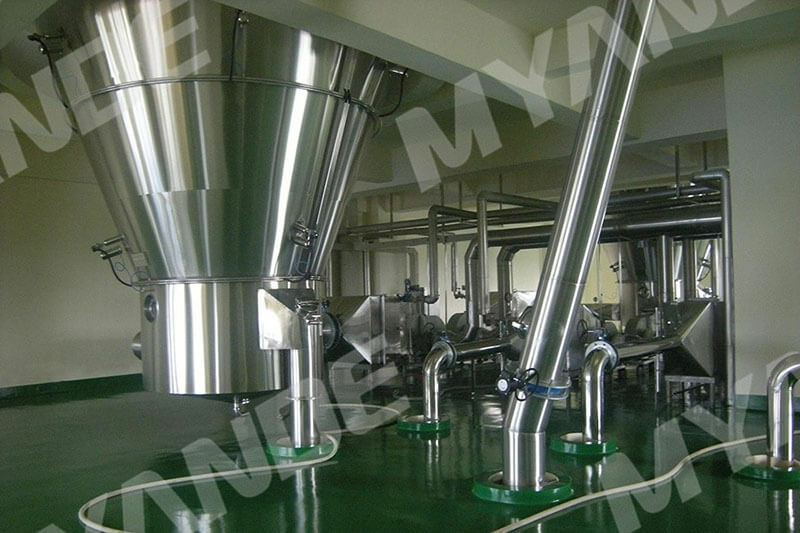 soy protein isolate machine For Sale | Myande Group Co., Ltd.
Soy protein isolate is extracted from meal through successive processes. The product is a kind of milk white powder which contains protein content of more than 90%. Soybean isolated protein can be recombined with various food to improve and enrich food nutrition. Low-temperature degreased soybean meal is firstly measured, then conveyed to extraction section. Initially white flakes mix with extracting solution in 1st stage extracting tank for a specific reaction time. Then mixture is pumped into horizontal screw decanter centrifuge for separating bean dregs which will be conveyed into 2nd stage extracting tank for further extraction. Mixture is pumped into horizontal screw decanter centrifuge for separating bean dregs which will be conveyed to drying section. Flowing acid precipitation, i.e. 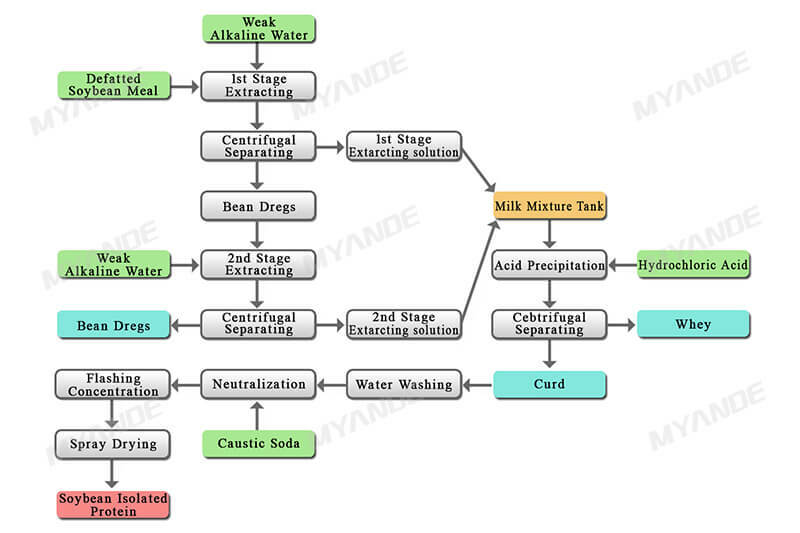 soybean milk is pumped into static mixer to react with a certain proportion of hydrochloric acid. Mixture is then pumped into acid precipitation tank, horizontal screw decanter centrifuge for separating curd which will be then pumped into water washing tank. Washed curd is pumped to neutralization section by rotor pump. 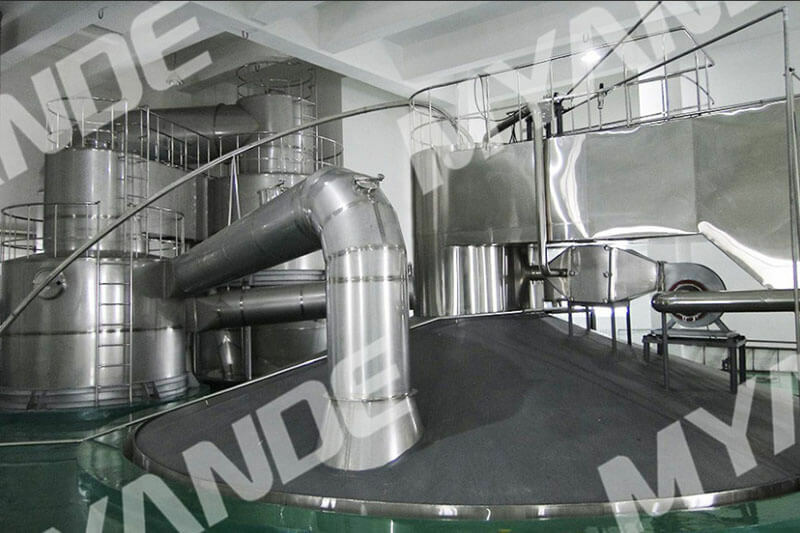 Neutralizing tanks can be used interchangeably to achieve continuous production.PH value can be adjusted to neutral by neutralization of curd and dilute lye in neutralizing tanks. 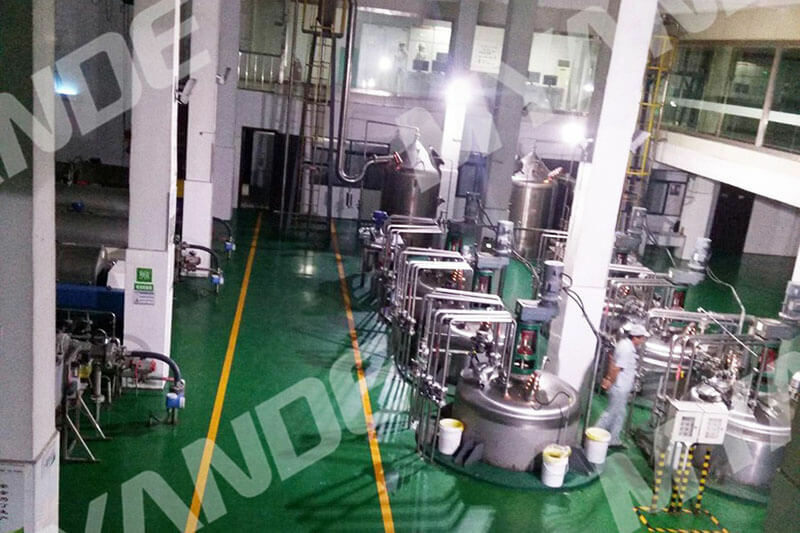 Curd is pumped into filter for removing impurities by pressure pump, then into sterilizer for instant sterilization and flash tank for concentration. 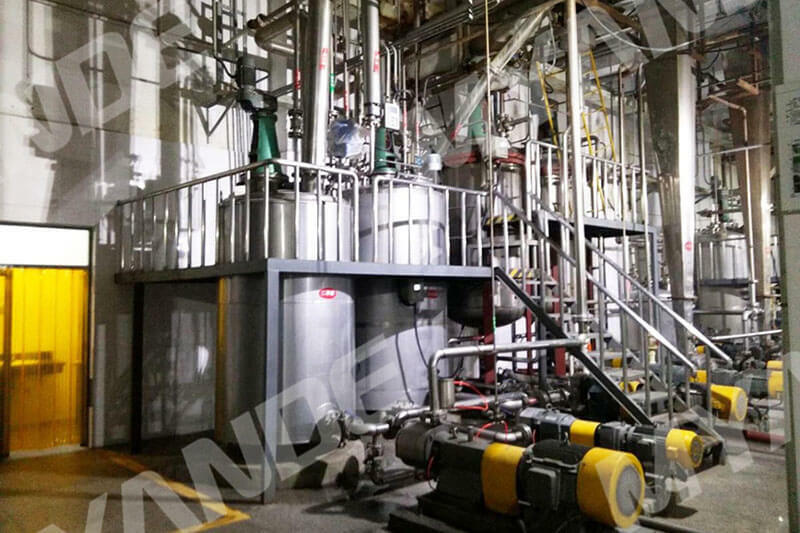 Finally curd is pumped to homogenizer, then to drying section by high-pressure pump. 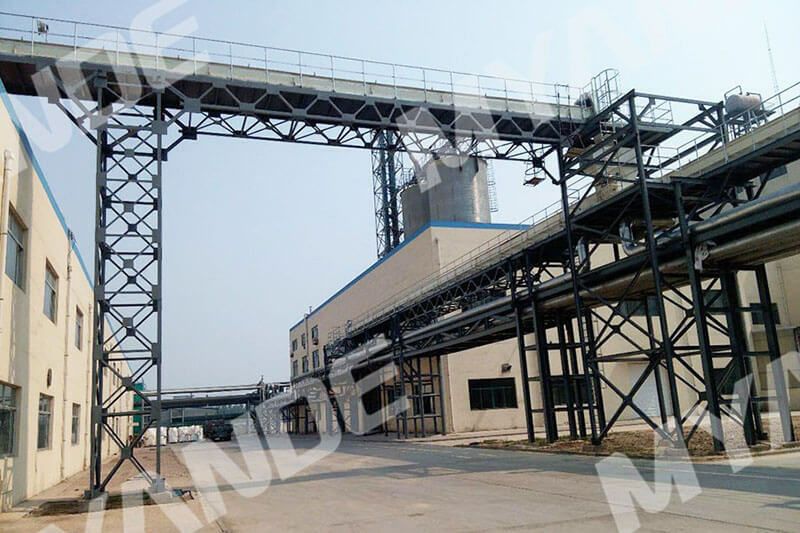 Curd is pumped into spray drying tower by high-pressure pump in which curd is turned into soybean isolated protein particle, then into cyclone separator by pneumatic transmission. Finally soybean isolated protein particle treated by screener is conveyed to finished product packing machine by pneumatic transmission. Bean dregs separated by horizontal screw decanter centrifuge is firstly treated by squeezing machine to remove a portion of water, then into bundle dryer for drying. Dried bean dregs is measured and packed, finally conveyed to warehouse.